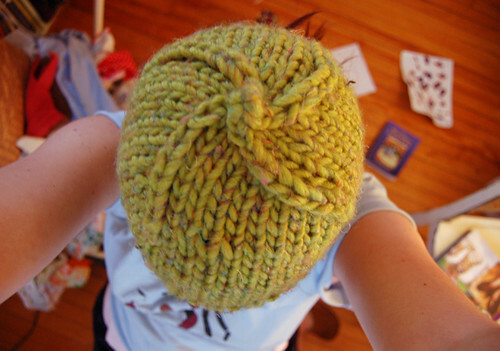 hat on top | Flickr - Photo Sharing! the marvelous land of oz, and spiderman stickers. hey! what's THEIR mess doing in MY room? oh wait. this is my mess. fabric scraps. Handknit Holidays. the book from which the hat pattern came. yes. my bright eyes tshirt. again. CPG of Standard Authority (Printers/Makers), and 3 other people added this photo to their favorites. I have been so tempted by that book many times ... I think it might be time to go ahead and get it, don't you?! great wool and hat. i love the way you decreased. thats just fun! I love the pattern and chunkiness is always a plus for me! Fabulous way to show off the hat!